The Amazing Spider-Man (1979) | 'TAIN'T THE MEAT… IT'S THE HUMANITY! In 1974 Fireside Books published the first ever collection of reprinted comic book stories, Origins of Marvel Comics by Stan Lee, now widely considered to be the first trade paperback. 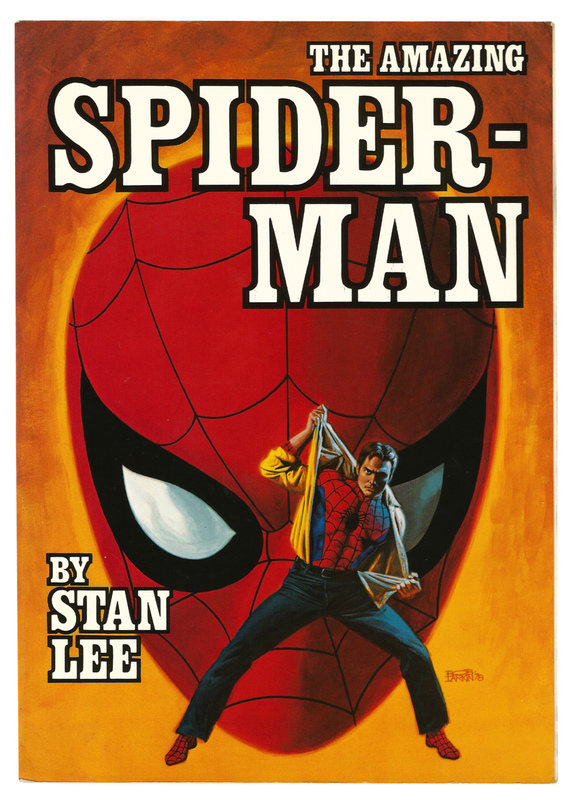 The book proved such a success that several more volumes of reprints followed between 1974 and 1979, including The Amazing Spider-Man by Stan Lee. 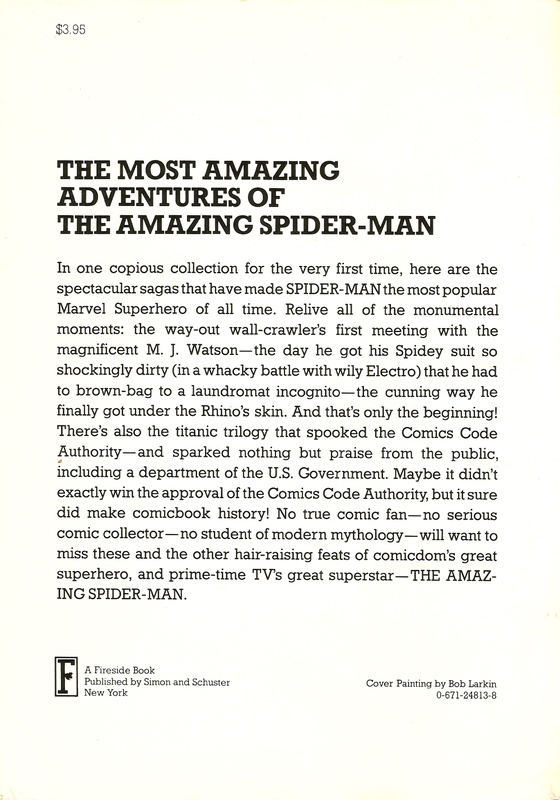 There are six stories printed in this volume: “The Birth of a Super-Hero!”, originally published in The Amazing Spider-Man issue #42 (November 1966); “Rhino On The Rampage!”, The Amazing Spider-Man #43 (December 1966); “And Then Came Electro!”, The Amazing Spider-Man #82 (March 1970); “…and Now, The Goblin”, The Amazing Spider-Man #96 (May 1971); “In The Grip of The Goblin!”, The Amazing Spider-Man #97 (June 1971); and “The Goblin’s Last gasp!”, The Amazing Spider-Man #98 (July 1971). Like the other Fireside books in this series this volume also features an introduction and epilogue written specifically for this collection by Stan Lee. These six issues comprise three story arcs, all of which have some significance to the Spider-Man mythos. In the first two-part story Spider-Man first gets into a fight with a temporarily super-powered John Jameson (son of J Jonah), and then with The Rhino, who he defeats by chemically removing the villain’s impervious outer hide. It’s all pretty standard fare but the highlight of the story, and the reason for its inclusion in this collection, is the first appearance of long-time Spidey supporting character, and love interest, Mary-Jane Watson. 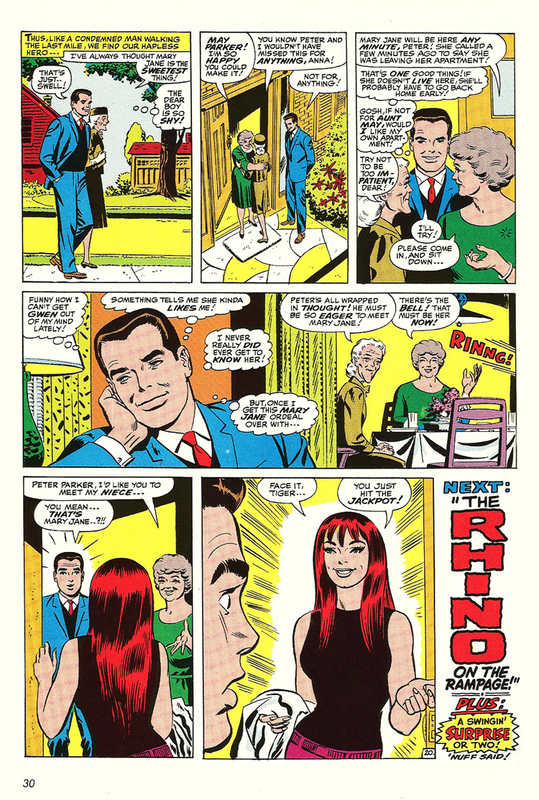 Artist John Romita, who honed his skills drawing romance comics prior to his run on Spider-Man does a great job of introducing Mary-Jane to the Marvel Universe, and her first words – “face it, tiger… you just hit the jackpot” – have gone down in comic book history. According to his introduction, the reason Lee included “And then came Electro!” is because it features “The Incident of the Paper Bag”: Peter Parker visits a launderette to clean his soot-stained Spidey outfit and is forced to wear a paper bag on his head to protect his identity. It’s a light-hearted moment in a story that involves Spider-Man trying to earn some quick cash by appearing on a late night talk show, only to be interrupted by his old enemy Electro. The inclusion of the story in this volume will also be of some significance to reader’s of the other Fireside Books as it was originally slated to appear in Origins of Marvel Comics, but was inexplicably replaced with another story. The last story arc is the most significant of the book, both in content and historical impact. In his introduction Lee states that in 1970 he received a letter from the Office of Health, Education and Welfare asking if Marvel would consider publishing a story about the dangers of drug abuse; Lee obliged with the three part story that rounds off this collection. 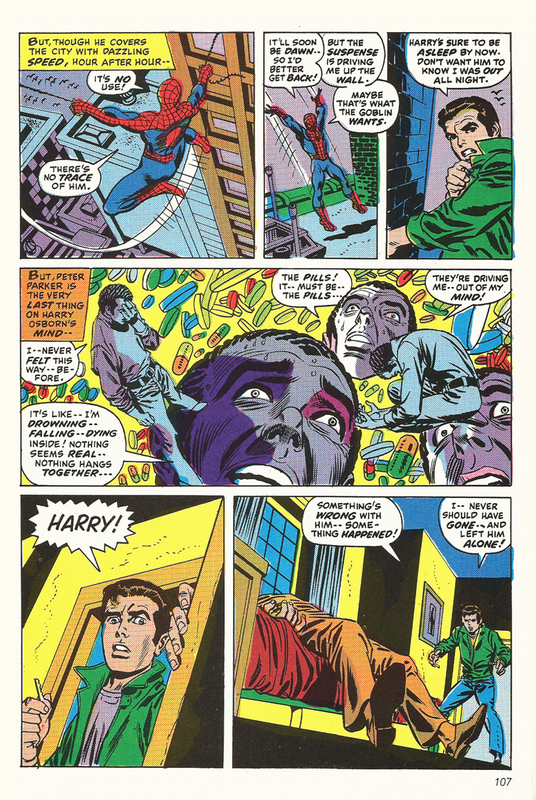 Lee wisely foregoes making his anti-drugs message the major element of the three issues and instead includes it a secondary story involving Peter Parker’s roommate Harry Osborn who, depressed over his unrequited love for Mary-Jane, overdoses on some pills he buys from a corner pusher. It’s a brave move on Lee’s part as Harry had been an important bit-player in the title for a number of years. The story also contains other anti-drug messages: Spidey rescuing a stoned young man who throws himself off a roof; The Daily Bugle running a story on the scourge of drugs on society and a conversation amongst Peter Parkers’ friends on how drugs are not just limited to ghettos. The overall message is clear: drugs are a blight on the whole of society and we all need to do our bit to fight it. Lee, clearly mindful that he is addressing a younger audience, keeps his message simple without becoming too preachy. By today’s standards his language is a little hokey – “Man, this drug scene really bugs me!” – but it’s impact in 1971 cannot be understated and the three issues were bestsellers. Art chores on all three issues are handled ably by Gil Kane with his usual flair and aplomb. The other repercussion of this story is it placed Lee and Marvel on a collision course with the Comics Code Authority, the industry’s self-regulatory censor. Established by the industry in 1954 as a knee-jerk reaction to the misguided belief that young people were been corrupted by the medium, the CCA vetted every comic that saw print. Under the CCA’s strict rules all references to drugs (even in an educational sense) were forbidden as were any hints of horror or excessive violence, and although they had no official powers to restrict publication many distributors refused to carry comics without the CCA stamp of approval. Lee come up with an simple solution to the CCA’s refusal to green-light issues #96-98 of The Amazing Spider-Man, he just published all three issues without the CCA’s approval. He gambled that the government’s request for him to write the story would grant him credibility and he was confident that the story’s message was strong enough to outweigh any possible sanctions by the CCA. He was right. Both the press and public opinion sided with him and the CCA appeared out of touch and were left weakened by the encounter – so weakened that soon after they relaxed their rules on drug depiction and horror in comics opening the door for the horror comics boom of the mid-seventies. Last word as always goes to Bob Larkin‘s painted cover artwork. Out of the four covers that he contributed to this series, this one is by far my favourite. I clearly remember seeing the book on sale in the early eighties and I was so impressed by how eye-catching the image was that I bought a copy on the spot. His artwork is the perfect combination of pulp paperback action and movie poster impact. So what if Larkin has made Parker look a little like a male stripper, it’s still a great piece of artwork. Next up: Marvel’s Greatest Superhero Battles by Stan Lee from 1978.